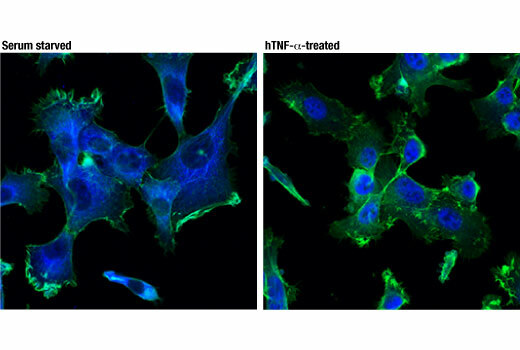 Confocal immunofluorescent analysis of HT-1080 cells, serum starved overnight (left) or treated with hTNF-α (20 ng/mL, 30 min; right), using NF-κB p65 (D14E12) XP® Rabbit mAb (Alexa Fluor® 647 Conjugate) (pseudocolor blue). Actin filaments were labeled with DyLight™ 488 Phalloidin #12935 (green). Flow cytometric analysis of Hela cells using NF-κB p65 (D14E12) XP® Rabbit mAb (Alexa Fluor® 647 Conjugate) (solid line) compared to concentration-matched Rabbit (DA1E) mAb IgG XP® Isotype Control (Alexa Fluor® 647 Conjugate) #2985 (dashed line). 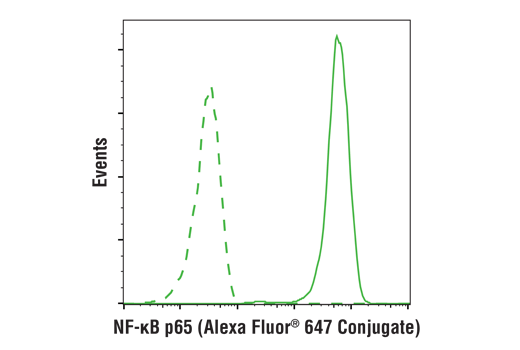 NF-κB p65 (D14E12) XP® Rabbit mAb (Alexa Fluor® 647 Conjugate) recognizes endogenous levels of total NF-κB p65/RelA protein. It does not cross react with other NF-κB/Rel family members.